Sweet Lassi is a very popular drink in North India during summer because of its cooling and refreshing properties. You can give the flavour by adding some cardamom powder or rose water in this lassi. It is a light lassi which you can also take during Vrat. 1. Take 8-10 cardamoms and crushed them well. Remove the husk and again crushed the seeds to make fine powder. Keep them aside. 2. In a big bowl, take 2 cup fresh chilled yogurt. Whisk the curd with a blender until it becomes smooth. 3. Now, add 8-10 Tbsp Sugar or as required. 4. Add 1 Cup of chilled water or you can also add milk instead of Water. I mainly mix the both with ½ cup of water and ½ cup of milk to make the consistency of the lassi neither thick nor thin. 5. Now, mix everything properly with the hand blender until sugar dissolves. Now add 1 tsp cardamom powder. If you do not want any flavour then you can skip this method of adding cardamom powder. Add ice cubes and mix again. 6. Pour lassi in a glass and garnish with pinch of cardamom powder. 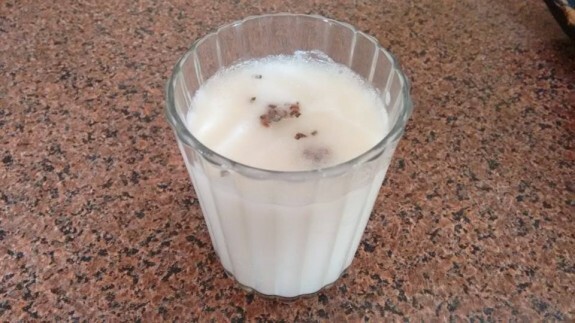 You can also top the lassi with 1-2 Tbsp of Malai and chopped dry fruits. Serve the lassi immediately.